Beach Babe Fitness: Kombucha : Get. Into. It. Kombucha : Get. Into. It. I have found the ultimate for pregnant women. It's a little gem of a tea called Kombucha. I've heard about all the health benefits of this probiotic, fermented tea over the past few years and I've tasted a few different brands. But, lemme tell ya, during pregnancy, my obsession for Kombucha has reached new heights. I must admit I've missing a glass or wine or a cocktail every once in a while and Kombucha has become my go-to "mocktail" for anytime of day. What makes things even better is that Kombucha is filled with healthy goodness to go along with it's refreshing bite. 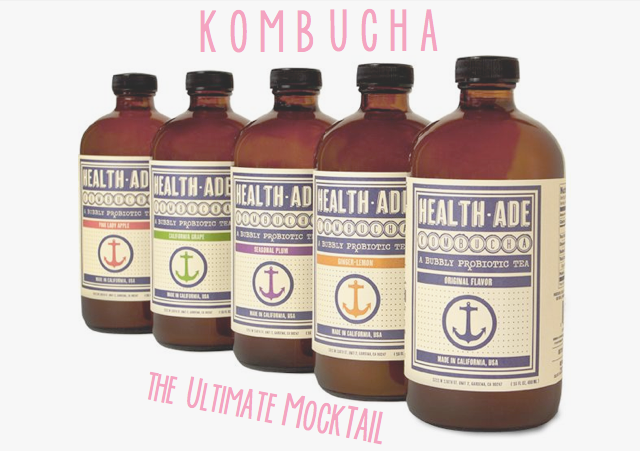 Increased Energy: Since Kombucha is a fermented drink, it does contain trace contents of alcohol. Luckily not enough to harm or even reach the baby. Whether it's the small dose of alcohol or the fizzy bubbles, Kombucha always puts a pep in my step. Clear Skin: My skin has been on a bit of a roller coaster throughout my pregnancy. Unable to follow my normal skin regimen, I noticed a huge difference in the clarity and texture of my skin when I started to drink Kombucha 3-4 times a week. Improved Digestion: Kombucha definitely helps to keep me regular. If you experience problems with digestion, probiotics (all that healthy bacteria) are the number one cure for any gut ailments. At $3-$4 a bottle, I've found that the only real setback to Kombucha can be the price. But you know what? When you pour it into a champagne or martini glass with a little strawberry garnish, it's worth every penny. Andddd it's still cheaper than my favorite glass of wine or cocktail... Cheers to being pregnant!